Up over at Samantha Walker, you can see how I made this cute bunny banner using her Samantha Walker Bunny cut file just in time to greet Mr. Cottontail! This banner was super easy to make thanks to Pick Your Plum wooden pennants, DCWV Linen Sheets, and only one cut used as a stencil! Having my Xyron Creative Station handy just added to the laziness ease of the project. I had the help of Hemptique Baker’s Twine to add a little extra bounce in the bunny tail and to be the support of project for holding together the pennants. I addes some buttons, faux stitching and fabric letters (yes you see them on all my projects! I just love them). This project was not only super simple and easy to do, but there is something therapeutic about just simply tracing and cutting and with this bunny cut from Samantha Walker, it could not have been any easier. 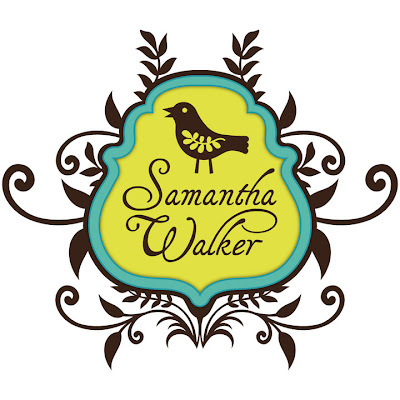 Full tutorial and supply list is up over on Samantha Walker’s Blog! Posted in Hemptique, Samantha Walker Designs, Silhouette, Silhouette Cameo, Uncategorized and tagged bunny crafts, crafts, DCWV, DIY, Easter Banner, Easter Decor, Hemptique, home decor, Samantha Walker, tutorial, Xyron. Bookmark the permalink. Burlap Meets Anna Griffin & Xyron! Happy St. Patrick’s Day! I got my crockpot cookin’ me up some cabbage! Oh my do I have a fun “sneak peek” for you today! As Anna Griffin’s new collection is gearing up for its debut on 24 Hour Craft Day on HSN the Xyron Design Team had the privileged to dive into the new collection and cook up some creative inspirations to share with you this week. Today is my turn and boy did I have fun! This project may have several components to it, but it came together with ease with the help of my Xyron 5 inch Creative Station, High Tack Tape and 3 inch Sticker Maker (a full supply list is located at the end of the post). I found a burlap wrapped canvas at Michales and some lace covered burlap and built my base. Then I moved onto the first component of making my mini clothespin wreath. Using a small wooden embroidery hoop as my base and wooden clothespins I primed them with white craft paint. I measured the strips and cut down the Anna Griffin collection paper. Inked the edges and applied Xyron High Tack Tape to the back of each paper strip, placed on each clothespin and sanded down the edges. I finished this with a lace ribbon. In making the frame, I applied 3D Enamel Gel from Globecraft and Piccolo to a wooden frame and the “Family” sentiment and allowed time to set and dry. Then I added Anna Griffin collection paper to the back of the frame securing it with Xyron High Tack Tape. Added the sentiment with a quick set glue. In making the simple but elegant embroidery hoop, I traced, cut and inked a sheet from Anna Griffin collection. I attached the to the wooden embroidery hoop using Xyron’s High Tack Tape along the face of the hoop. I then sanded down the edges and finished it with a lace ribbon. In making the wooden letter, I primed it with white craft paint. I traced, cut and inked the letter using Anna Griffin collection paper. I then ran it through my Xyron 5 inch Creative Station and attached it to the wooden letter, sanded down the edges and retouched with ink. In wanting to add a little extra pop to the project, I put to use a burlap rose and two linen buttons I had on hand. Using a 1 inch paper circle punch I punched out two circles from the Anna Griffin collection, inked the edges and ran them through the Xyron 3 inch Sticker Maker and applied each to the linen buttons. I finished this project by arranging all the components onto the burlap base and used hot glue to attach them. This was a great project to create and you will not want to miss out on seeing what Anna Griffin has in store for you on March 24th on HSN. Check your local listings, Follower her on Facebook and her blog for more details. AND be sure to head over to Xyron’s Blog each day this week to see what we got cookin’ with Anna Griffin! Posted in Uncategorized, Xyron and tagged 24 Hour Craft Day, Anna Griffin, burlap, Clothespin crafts, Clothespin wreaths, crafts, crafts made with burlap, Creative Station, DIY, embroidery hoops, home decor, HSN, papercrafting, upcycling, Xyron. Bookmark the permalink. Hi and welcome to my first official post for Xyron! Today I am super excited to also be featuring Miss Kate Cuttables during our partnership blog hop week! I am no stranger to Miss Kate Cuttables and have loved doing projects with her clever and super cute cuts. Combining them with Xyron products was just icing on the cake. Below are the cuts I was “lucky” enough to play with for this project! Who doesn’t like creating with mason jars? They are cheap, durable and a great starting point to any crafty creation. With the help of my Silhouette, my Xyron 5 inch Creative Station and a little luck I was able to whip up this wee bit of the Irish decor! I first measured the opening of the mouth of the quart jar to plan out my cut sizes. Then using my Silhouette, I cut out all the components of the project. I wanted each component to be double sided so I copied each cut and flipped it. Once all cuts are removed from the mat, I began to load all the cuts into my Xyron 5 inch Creative Station and added once each set ran through. I then began to build each cut by layering and placing together. Using Xyron 3/8 inch High Tack Adhesive Dots, I layered the clouds onto the rainbow. For the “gold” component of the project, I dusted each side I ran through the Xyron Creative Station with glitter, shook off the excess and repeated on the other side. I then glued each glittered piece together and glued it to the pot. In preparing the lid, I traced the inside of the lid on chipboard and cut out. I then ran it through my Xyron 5 inch Creative Station attached it to the bottom of the sealing cap and added more adhesive on the top of the chipboard using my Xyron 1/2 inch Mega Runner. I then cut-to-fit some spare Styrofoam I had on hand. Using a green ink pad, I inked the Styrofoam and then attached the Styrofoam to the chipboard and ran more adhesive on the top of the Styrofoam (this will help the moss to blend and stick well to the Styrofoam) and then put together the lid and set aside. After cutting down a toothpick and two wooden skewers, I hot glued them to the pot of gold and the rainbow and placed into the lid. Once the rainbow and pot of gold was in place I added the clovers with the adhesive backings created by the Xyron Creative Station. Adding the moss was the final touch before placing in the jar and closing it up. the moss stuck perfectly to the Mega Tape Runner adhesive applied to the Styrofoam. In finishing the project I wrapped 5/8 inch ribbon around the lid securing it with Xyron 3/8 inch High Tack Adhesive Dots. There you have it! A fun way to add a bit of Irish luck to your decor. Now head over to the Xyron Blog and Facebook Page and see what else we have cookin’ with Miss Kate Cuttables! Also be sure to head over to the ever-so-talented Shellye McDaniel over at Papered Cottage– she takes CUTE to a whole new level! And don’t forget to visit Miss Kate Cuttables and sign up for their FREE daily cutting file while you are at it too! Posted in Paper crafting, Silhouette, Silhouette Cameo, Xyron and tagged crafting, crafts, Creative Station, DIY, glittering, home decor, mason jar crafts, mason jars, Miss Kate's Cuttables, Rainbows, Silhouette, St. Patrick's Day crafts, Xyron, xyron adhesive dots, Xyron Mega runner. Bookmark the permalink.